Andy H: Aha! Now this looks like a healthier looking pull-list this week. Some newbies to check out plus some favourites make it on to my pile. 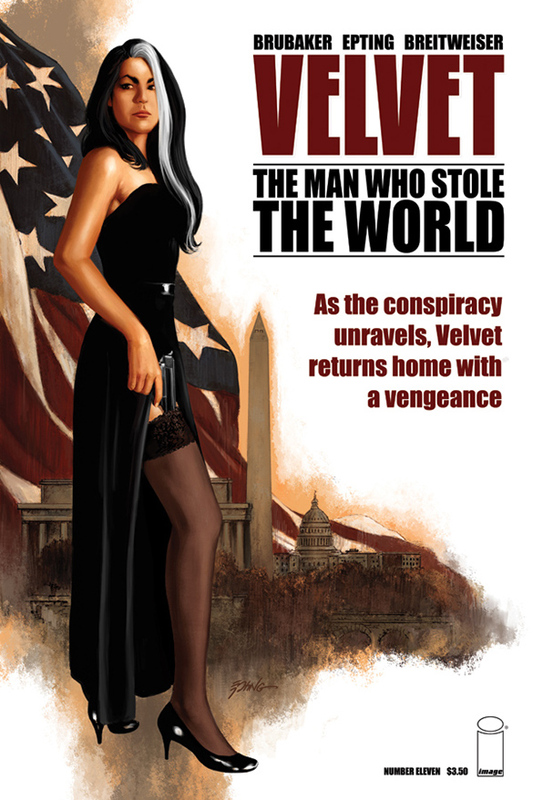 First and always eagerly awaited is Velvet #11. A beautiful looking book thanks to Steve Epting and Elizabeth Breitweiser bringing the story by Ed Brubaker to stunning life. This is the start of the third story arc - 'The Man Who Stole The World' - and after reading the first two arcs I'm excited to see Velvet Templeton back in action. This is spy fiction at it's best. New from Image this week is Beauty #1 which looks at the darker side of beauty. What if you could be beautiful but at a terrible price? The art looks nice and the concept has me intrigued so it makes the list. Over at BOOM! Studios is Americatown #1. In a twist to the norm it's America that has suffered an economic collapse and its citizens are sneaking across international borders to find work. Written by successful screenwriters Bradford Winters and Larry Cohen I think this should be a pretty hard-hitting series that I can hopefully get my teeth into! Squarriors #3 finally hits the shelves but when you see the art you can forgive a little lateness. The disparate tribes of squirrels (hey, don't look at me like that!) continue their struggle for survival. This is a beautifully painted book by Ashley Witter and well worth a look. I picked up Eltingville Club #1 some time ago and #2 is finally here. It's a parody of fans of all things geeky. Some parts we will see aspects of ourselves in, others writer Evan Dorkin takes to the Nth degree, generally to great effect, and it will be fun to see where the four main characters end up. This Wednesday we see the start of a weekly Doctor Who series... well, for five weeks anyway. Featuring the most current incarnations of the Timelord, Four Doctors is written by Paul Cornell, who knows his way round the Tardis, so something to look forward to for us Who fans. Adding Secret Wars #5, Lantern City #4 and Harrow County #4, it all makes for some great reading this week. Matt C: Secret Wars #5 is my undoubted highlight this Wednesday as the event has been far more successful, and fulfilling, than I'd hoped. Obviously for anyone who saw the new Fantastic Four movie over the weekend, this issue should provide a timely reminder of what a great character Doctor Doom is (and how Hollywood has repeatedly shown that the don't understand why). Americatown #1 looks interesting too. It may be a case of TV guys using a different medium to provide a ready-made, storyboarded pitch for a TV series or it might be something better, and far less cynical, than that. Worth investigation either way. Lando #2 will be a most welcome sophomore effort if it's anything like it's predecessor and Letter 44 #19 should continue to build on the magnetic, interweaving narrative Charles Soule's been building. Gears & Bones #1 is an unknown quantity from an unknown (for me, at least) publisher called Guardian Knight Comics. The artwork I've seen from it looks very impressive and at $1.99 it's certainly worth a punt. King #1 will get a look ("a post-apocalyptic Conan the Barbarian as directed by Sam Raimi", apparently) due it's promise of weirdness and the man in the scripting chair being Joshua Hale Fialkov (of The Bunker fame). Hopefully at least one of the aforementioned debuts will find a regular place on my pull-list!